The 240' ocean going motor yacht is the largest produced so far by Delta shipyards. 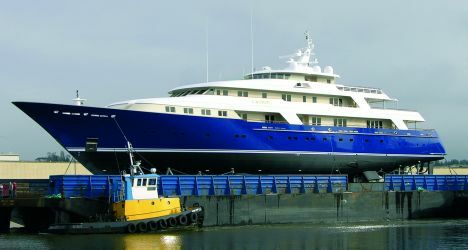 Recently launched, "Laurel" not only represents the biggest super yacht produced by the American shipyard for its clients, but its also the biggest ever to be assigned to the old continent for construction, in the past 75 years. The naval architecture and engineering was designed by Delta's design group comprising a handful of experts within Delta Marine's structure, together with designer Donald Starkey. "Laurel" has a steel hull and a composite super structure to contain price and weight. The interior design has a characteristic layout aimed at elegantly matching different shared areas to very private ones aided by the massive use of exotic essences, particular textures and a play of glass panelling which give it an overall modern atmosphere. The chromed exteriors in between the white superstructure and the shining "Royal Blue" hull enhance "Laurel's" waterlines. Below the waterline, Delta's design group matched the ocean goers' expectations as to reducing fuel consumption in favour of increasing its range, thanks to prolonged hydrodynamic studies. From a technical point of view Delta's 240' motor yacht stands out for its sophisticated entertainment system and use of a good 1200 sensors to monitor and manage all the systems on board. The motor yacht's manoeuvrability is upheld by a 250 Kw. bow thruster and by a 150 Kw. stern thruster. A Quantum QC 1800 Zero speed system has been installed to stabilize the yacht at anchor. To satisfy the owner's requests "Laurel" was built in conformity to: Lloyds Yacht (P) Register, the MCA's, IMÒs and ISPS', "Laurel" furthermore corresponds to the requisites laid down by the International Convention for the Prevention of Pollution from Ships and to the foreseen safety measures at sea. For further information: Delta; 1608 S. 96th Street; Seattle; WA 98108; tel: 001.206 7632383; fax: 001. 206 7622627; web page: www.deltamarine.com.